How’s this for a winter ride? Timm Kölln‘s work is stunning. 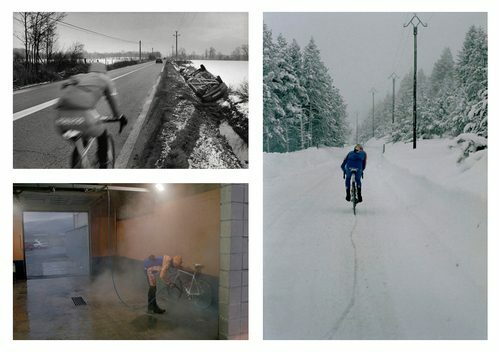 This series of photos documenting Juan Antonio Flecha on a winter ride in the Pyrenees mountains really captures what it means to train in the winter as a professional cyclist. I was so distracted by the car wash bike cleaning that I completely missed the upside-down car in the ditch! All of his black and white photography is printed on Gelatin Baryta Paper, giving it an eerie atmosphere, which makes that photo even more surreal. Thanks to Ben for shooting this over. Much appreciated!